Diana Yohe, of Willoughby, Ohio, began her ballet training under Courtney Laves and Mark Otloski at the City Ballet of Cleveland. She furthered her training in Joffrey Ballet’s Trainee Program in 2011 and Pittsburgh Ballet Theatre School’s Graduate Program in 2012. 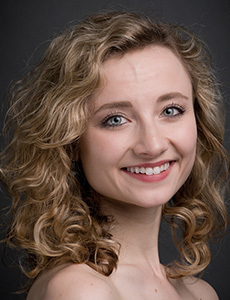 Since joining the company in 2013, she has performed lead roles, such as Marie and the Sugar Plum Fairy in Terrence S. Orr’s The Nutcracker, Wendy in Jorden Morris’ Peter Pan, Myrtha in Terrence S. Orr’s Giselle and Alice in Derek Deane’s Alice in Wonderland. She has also danced featured roles in Twyla Tharp’s In the Upper Room; George Balanchine’s Western Symphony; Michael Smuin’s Eternal Idol; James Kudelka’s The Man in Black; Jiří Kylián’s Petite Mort; William Forsythe’s In the Middle, Somewhat Elevated; and Jerome Robbins’ Fancy Free and In the Night. Diana is married to PBT dancer Joseph Parr and is delighted to be at PBT for her sixth season.